Adorable, but more of the same. 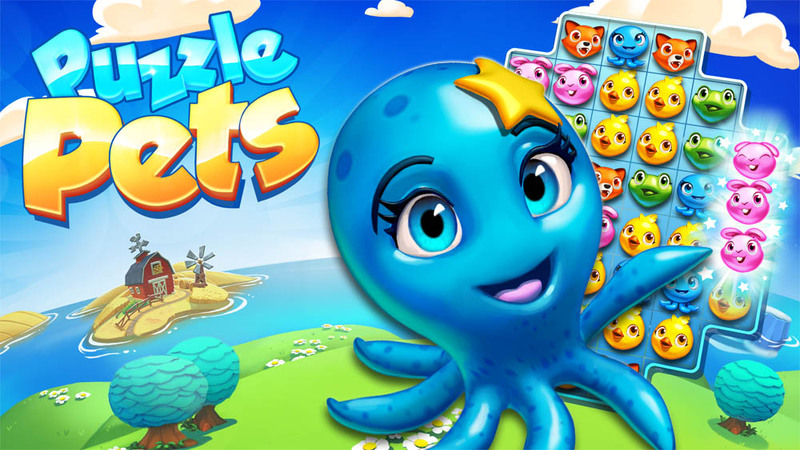 There's a wide variety of match-three games out there in the wild, and Puzzle Pets is the latest to join the fold. It's basically a by-the-numbers venture that hardly needs explaining, but it's at least got several kinds of adorable pets to its credit, and that's better than fruits, candy, sodas, or other bizarre choices for puzzle games. Just to be clear, I'm glad it didn't decide to use "saga" or "story" in its name because it's completely devoid of such. This is an easy to understand and simple to play puzzler that takes no time to get into. You've seen it hundreds of times before, so you'll be able to jump right in. It's vivid and colorful, with several different pets to rescue by chaining together combos, and six pets available to create up to 10 combos. You can use the pets later on in the course of the game as Helpers, which offer additional tricks to aid in your matching adventure, so playing strategically will work to your advantage. You can use 7 different boosters as well, like the Chameleon's tongue or Tornado in order to blow away the competition. There's not much variety when it comes to this game, and not much to set it apart from the dozens of other puzzle games out there. In fact, it's basically an amalgam of several different other titles that have been released in succession. It's a decent idea, and fully playable, but it really doesn't innovate. There's no doubt that you've played this game several times over, so it'll appeal to you if you're a fan of the genre, but in the end it's just another matching puzzler.